Skip the hype around ancestry DNA tests that offer little more than your basic historical heritage; and opt instead for a full genetic profile of 75+ medically relevant reports. 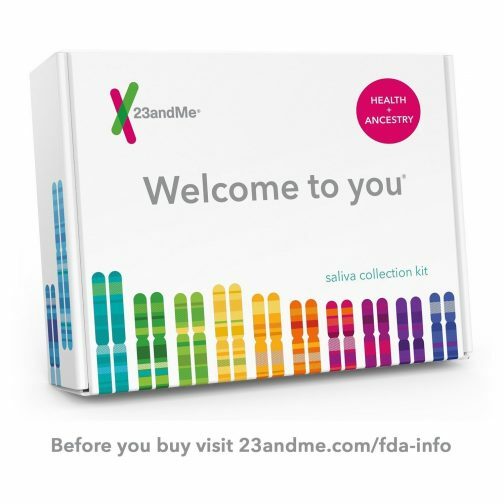 After a fault start with the Federal Drug Administration (FDA), 23andMe has been approved for direct to consumer testing of DNA for genetic health risks such as Parkinson’s Disease and carrier status testing for things like Sickle Cell Anemia and Cystic Fibrosis. Genetic Health report of risks for certain diseases. Wellness reports on how your genes play a role in your well-being and lifestyle choices. Carrier Status to learn if you are a carrier for certain inherited conditions. Traits - see how your DNA influences physical traits like facial features, taste, smell and others. FDA-cleared, clinical grade mobile EKG monitor: Kardia is the most clinically-validated mobile EKG used by the world's leading cardiac care medical professionals. Free with device purchase, the basic service allows you to instantly know if your heart rhythm is normal or in atrial fibrillation. Patients can email the latest EKG recording to yourself or your physicians. Upgrade to premium service through the app for unlimited history and storage of your EKG recordings plus receive a monthly EKG summary report to share with your doctor. And includes the ability to track various vital statistics like your blood pressure, activity and weight and other metrics. EverlyWell makes at home health testing easier than ever. Order directly, test your health from the comfort of home, get easy-to-read results within just days. “I haven’t been this excited about something in the medical arena for a really long time”, business maven Lori Greiner exclaimed following the EverlyWell pitch on the hit TV show Shark Tank. Our editors zeroed in on their unique inflammation and vitamin D test as our recommendation. But checkout EverlyWell's complete offer of easy at home tests that include: STD, Fertility, Food Sensitivity and more. Inflammation could be killing you and you might not even know it’s there. Most of us know that inflammation is the main cause of everyday aches and pains - even the redness and swelling around cuts and bruises. This is called acute inflammation, and is a beneficial response to trauma. The problem is, not all inflammation causes pain or is a result of trauma - but rather persists chronically. Often a result of ongoing stress, poor diet and lifestyle choices, chronic inflammation contributes to major health concerns like heart disease, diabetes, and Alzheimer’s. Everybody is talking about Omega-3s. Find out if your really need it? The answer is you probably do! But to know for sure you can order something called the HUFA test. HUFA stands for "highly unsaturated fatty acids" primarily the "long-chain" omega-3 and omega-6 fatty acids essential to brain, eye, and immune system health. The National Academy of Sciences has linked more than 60 chronic diseases to omega-3 fatty acid deficiency. Western civilizations are not only lacking omega-3s in their standard diets, they are eating too many omega-6s, creating an unhealthy imbalance. Because the Standard American Diet (SAD) is so out of balance, most Americans suffer from silent inflammation and related disorders. The Global Summit on Nutrition Health and Human Behavior has recently stated that, “brain and heart disorders resulting from omega-3 (EPA & DHA) deficiency are the biggest challenges to the future of humanity”. The top sources of long-chain omega-3 EPA’s & DHA’s come from wild caught marine sources like Salmon and Anchovies. Conversely, short-chain omega-3s come form plant source where less than 5% are converted into the bioavailable forms of EPA and DHA. That’s why our Editor’s Choice test and supplement source for EPA/DHA is Vital Choice Wilde Seafood and Organics company. Vital Choice is at the forefront health advocacy through their promotion of home delivery of the world's finest wild seafood and organic fare, harvested from healthy, well-managed wild fisheries and farms. This combo test/book will alert you of a potentially harmful imbalance in your omega-3 and omega-6 fatty acids. Dr. Sears book will then show you the way to reverse these imbalances and get you and your health back in balance. I am really stressed out! Really? Cortisol spikes whenever we are stressed. The trouble is, who among us has no stress? High cortisol frequently causes a saggy belly or pendulous abdomen too! Although not all stress is created equal —any kind of stress is interpreted by the body as stress including illness, toxic stress from the environment and personal care products, over exercising, and mental stress. Even dieting itself is stress to the body! Cortisol is another hormone easily tested and tracked from home. 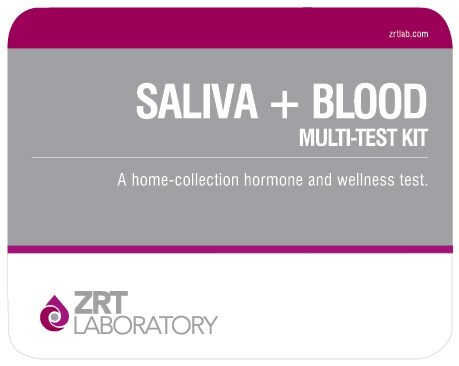 A simple spit saliva Cortisol test kit can be purchased online. When determining if Cortisol levels are affecting your weight loss struggles, it is important to track your Cortisol several times throughout the day because cortisol levels should slowly rises as you sleep and should be highest in the morning. Midlife crisis or hormone imbalance? Free Testosterone (Free T) & Total Testosterone (Total T) hormonal imbalance home test kit is perfect for both men and women who are experiencing symptoms of a testosterone hormonal imbalance. Low testosterone symptoms may include: lowered physical energy & stamina, lowered libido, weight gain, osteoporosis & muscle weakness or loss of muscle. Free testosterone is measured in a saliva sample and total testosterone is measured in a blood spot sample. All lab and shipping fees are included in the cost of the kit and results are available approximately 5 to 7 business days upon receipt of sample at the lab. A comprehensive results report will be emailed to you so you can discuss your results with your doctor. Fully integrates with the Qardio product family, allowing users to upload, store and share data and trends with family or doctor, triple measurement averaging, reminders, geo-tracking across locations and many more. Measures systolic and diastolic blood pressure levels and heart rate with irregular heartbeat detection. Does Butter In My Coffee Really Put Me Into Ketosis? Ketone levels and ketogenic diet are the cross-fitters and paleo enthusiasts term du jour. But did you know ketosis and the ketogenic diet plan was first invented in the 1920’s? Its original evolution within the health sphere saw many significant health benefits for previously untreatable epileptics. People with conditions unmanageable by medication suddenly found their symptoms improving because of a careful ketogenic change to their lifestyle. With a diet plan boasting countless great benefits, the ketosis revival is now in the making. The key to success with a ketogenic diet is regular and consistent monitoring of blood ketone levels. Read how to choose a great ketone monitor. Get started testing for Ketosis right away. Everything is included for testing Ketones. Sure you are losing weight, but what’s really going on under the hood. Lost weight sometimes means lost muscle. That’s why many health coaches say weight alone is not a good measure of diet or exercise success. Rather, practitioners say that a mix of bio-statistics including body fat percentage, BMI, skeletal muscle, resting metabolism, visceral fat, and weight when combined are a better estimate of overall health. Enter the Omron Body Composition Monitor with 7 different fitness indicators. Measures 7 different fitness indicators including body fat percentage, BMI, skeletal muscle, resting metabolism, visceral fat, body age, and weight. Accurately easures body fat percentage using proven bioelectrical impedance method. Easy-to-read digital screen displays body weight up to 330 pounds in seconds. Stores up to 4 individual profile settings so the whole family can track their progress with 90 days of memory. Retractable cord makes it suitable for adult users up to 6’ 6 3/4” tall. Nothing wrong with a good healthy read as a stocking stuffer. Check out our healthy book library for the latest best sellers from Dr. William Davis, Dr. Richard Maurer and Dr. Steven Gundry. We may have a broken healthcare system, but the code to individual good health has been cracked. Learn from these experts who have changed the lives of millions of people by teaching them the correct foods to eat (and not eat), what blood markers are really important, how to test and track your health from home, and more. By applying the expert advice of these authors you can take charge of your own health for many years to come.